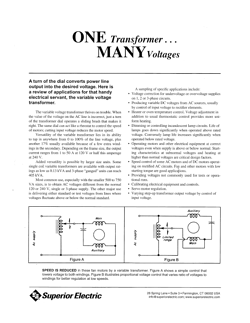 The variable voltage transformer thrives on trouble. When the value of the voltage on the AC line is incorrect, just a turn of the transformer dial operates a sliding brush that makes it right. The same dial can act like a rheostat to control the speed of motors; cutting input voltage reduces the motor speed. Versatility of the variable transformer lies in its ability to tap in anywhere from O to 100% of the line voltage, plus another 17% usually available because of a few extra wind­ings in the secondary. Depending on the frame size, the output current ranges from 1 to 50 A at 120 V or half this amperage at 240 V.
Our skilled and dedicated Customer Service Representatives are on-hand to assist you with any questions you may have about any of our products, their operation, installation or functioning, or to develop a customized solution for your application.